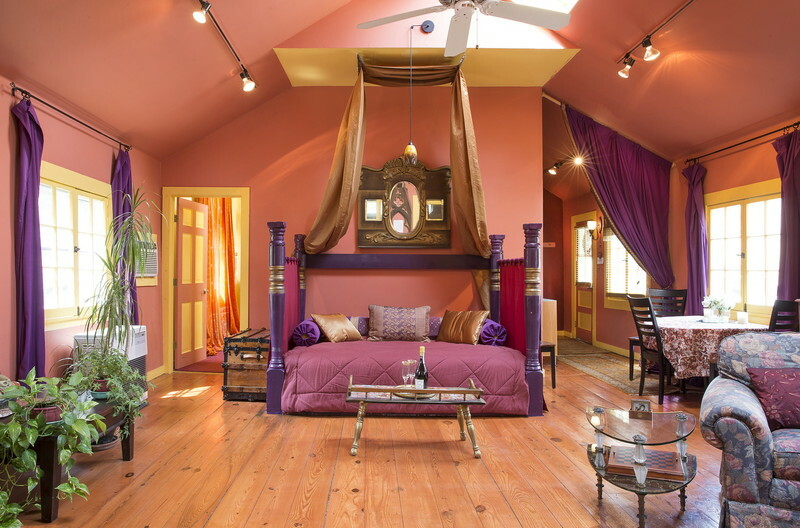 Located a short walk from the center of Woodstock, NY, the Blue Pearl is a private, quiet, comfortable, elegant and very romantic cottage! It is owned by an artist and is filled with original art work and unique details. The Blue Pearl offers 900sq ft of luxury, with 2 queen size beds, designer bedding, beautiful bathroom, equipped kitchen, a private bedroom with chandelier, skylight and gorgeous draperies. Enjoy the town and the surroundings or stay home and relax on your sultan-style sofa, basking in the sunlight streaming through the skylights 20 feet overhead! The living room is huge but cozy with Tuscan colors, a sitting area with couch, comfy chair and a fire place, a desk and library area. The lighting is gorgeous throughout the cottage. In the summer, have your meals in the garden over looking the Catskills Mountains, or lounge in the sunny meadow, surrounded by flowers and tall grasses, and snuggle under the stars at night by a blazing fire in the fire pit and glowing torches. In the winter, ski the nearby Catskills slopes, or cozy up to a fire in the gas-fueled heat stove while admiring the mountain view. The Blue Pearl is truly a hidden gem and oasis, a place former guests have described as “a work of art’ and was described in a local travel magazine as ’the lodging equivalent of a consciousness raising that inspires renewal of mind, body and spirit.